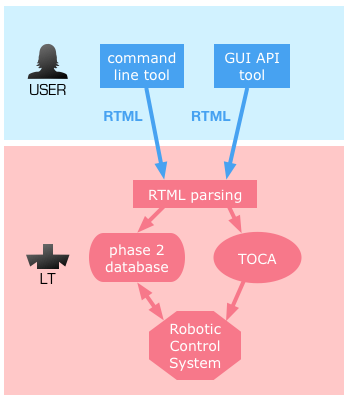 Simplified flowchart of user RTML submission to LT. The low-resolution spectrograph SPRAT recently joined IO:O and IO:I as an instrument that can also be accessed by an alternative method — that in some cases can be faster, more convenient, and allow for immediate response to transient events (TAC permitting of course). This method is RTML. What may not be so widely known is the alternative way of entering observation details, which in some cases is faster and more convenient. It uses the "Remote Telescope Markup Language" (RTML) protocol*, which was invented in 1989 at the University of California at Berkely, USA. It's a special dialect of XML (Extensible Markup Language), and is used to remote-control telescopes, or to communicate with autonomous robotic telescopes. Both RTML interfaces can also talk directly to the Target of Opportunity Control Agent (TOCA), the system that triggers the LT's rapid-response capability to interrupt the current observation and immediately observe your target instead. The LT already does this for Gamma-Ray Burst alerts via a different protocol, but it's also possible via RTML. * Not to be confused with the entirely different proprietary programming language used exclusively by Yahoo! 's web hosting services – their RTML stands for "Robert T. Morris Language".